Status: Uncommon regular breeder southeast. Rare casual winter and spring visitor away from southeast. Documentation: Photograph: 24 Jan 1991 Bellevue, Sarpy Co (Grenon 1991). Taxonomy: There are two subspecies, pileatus, resident south and east of south-central Texas, southeast Kansas, southern Illinois, and Maryland, and abieticola north and northwest of the range of pileatus (Pyle 1997). Nebraska birds present prior to extirpation around 1900 were abieticola (Bruner et al 1904, AOU 1957, Rapp et al 1958), and presumably re-establishing birds are also. Changes Since 2000: Pileated Woodpecker has undergone an expansion of its range north and west in northeast Kansas and southeast Nebraska. Since extirpation in the late 1890s and the first more recent sighting in 1952, increasing reports culminated in nesting in 1999 and 2002 at Fontenelle Forest, Sarpy Co and Indian Cave SP, Nemaha and Richardson Cos, respectively. Sightings in the Little and Big Blue River Valleys, Jefferson and Gage Co, that began around 2011 probably represent an expansion from Kansas. There continue to be new sighting locations in both general areas, and the species is probably breeding at more than the two confirmed locations. Resident: This species was extirpated from Nebraska prior to 1900; the last report was from near Omaha, Douglas Co 20 May 1895, where it was “formerly not uncommon in the more heavily wooded portions of the Missouri bottoms,” and may have bred (Bruner et al 1904). However, since 1952, when the first recent Nebraska report occurred, the species has re-occupied its former range. Reports since 1952 are mostly from extensive riparian forest and adjacent upland woodland in the lower Missouri River valley, north to Washington Co, and, very recently, in the Little and Big Blue River Valleys. It is likely Pileated Woodpeckers have expanded into Nebraska by moving up different river corridors in the south and east: northwest Missouri for the Nebraska Missouri River Valley (Robbins and Easterla 1992) and tributaries of the Kansas River in Kansas for the Little and Big Blue River drainages. There is no evidence as of 2016 for the presence of Pileated Woodpeckers in the Big and Little Nemaha River Valleys; this is probably due to lack of suitable habitat in those drainages, which are primarily devoted to row-crop agriculture, other than an older report of one in a farm woodlot near Cook Feb 1970 (Fiala 1971). Thompson et al (2011) stated that since the 1960s it has expanded westward in Kansas River tributaries; an early Nebraska sighting of one along the Republican River near Franklin in summer 1974 (Brown 1975) was probably of a dispersing bird from Kansas, as may have been one in Hall Co 13 Mar 1998. The first modern report in the Missouri River Valley was of one at a suet feeder near Fort Calhoun 26 Oct 1952 (Rapp 1953). There were two reports 1970-75, an undocumented report of one in Omaha in 1970 (Fiala 1971) and another that came to a suet feeder in Omaha 8 and 10 Feb 1975 (Cortelyou 1975). A series of sightings from Fontenelle Forest occurred 1983-86, possibly involving the same bird. These reports, most undocumented, were in the period 7 Dec-early Jun. Another was seen repeatedly and photographed in Fontenelle Forest 24-27 Mar 1991 (Grenon 1991, Wright 1991). The first modern documented nesting was of a pair along North Stream Trail in Fontenelle Forest, first seen in the area 25 April 1999 and subsequently seen by many observers; singles had been reported to the south in Fontenelle Forest near Great Marsh 16 Jan, 7 Apr, 18 Apr, and 25 Apr. The activities of the North Stream Trail pair were carefully studied 30 Apr, copulation was observed 4 May, and two young were successfully fledged by 10 Jul. A count of six was made at Fontenelle Forest 4 Jul 2000, and nesting continued in subsequent years; in 2005 nest locations showed that at least two nesting pairs were in the Forest. As of 2015, evidence suggests that Fontenelle Forest may hold three pairs (Rick Schmid, personal communication). Indian Cave SP, Nemaha and Richardson Cos is also a consistent breeding location in the Missouri River Valley; although calls and holes attributed to this species were noted 3-4 May 1969 (Tate 1969), no birds were seen. However, in 2002, two birds were seen entering holes in dead trees at the south end of Indian Cave SP 14 May 2002; they were feeding two almost fully-grown young 25-26 May 2002 and had left the nest area by 16 Jun (Mollhoff 2004). Reports have continued at Indian Cave SP; a second nest was found 9 Jun 2007 that had three young 16 Jun. As of 2015, there appear to be at least three pairs at Indian Cave SP. Although the above breeding records are the only ones confirmed to date, there are areas where repeated sightings suggest that breeding is occurring, notably in the lower Missouri River Valley and in Jefferson Co. Between Fontenelle Forest and Indian Cave SP there are regular reports suggesting the species occurs in low densities along the Missouri River Valley in appropriate habitat. A series of sightings of single birds beginning during fall 2002 along the Steamboat Trace trail about 2.5 miles south of the Omaha Public Power Plant in Otoe Co are suggestive of resident birds, but no evidence for breeding has been reported. There are also multiple reports from Washington Co, including the Krimlofski Tract, Neale Woods, Douglas Co, and DeSoto NWR, beginning in 2010, when 1-2 were at DeSoto NWR 24 Apr and Feb 28. N.P. Dodge Park and Hummel Park, both in Douglas Co, have also had several reports, beginning with one at Hummel Park 8 Nov 2006. The only records north of Washington Co are three in 2018, indicating continued range expansion northward; singles, all first county records, were at Ponca SP, Dixon Co 18 Mar 2018, Kramper Lake, Dakota Co 21 Apr 2018, and westward near Wynot, Cedar Co 1 and 7 Nov 2018. There is a series of reports from the Little Blue River drainage in Jefferson Co, where, as might be expected, initial reports appeared to be of post-breeding dispersers: west of Fairbury 13 and 19 Sep 2011, and two on 15 Nov 2012. Since those reports, it has been reported south of Fairbury along a hike/bike trail and adjacent Flathead WMA, Jefferson Co, a likely breeding location, 4 May 2013, 3 May 2014, 18 Jan 2015, and 5 May 2016. The westernmost record to date in the Little Blue River Valley is of one near Hebron, Thayer Co 23 Jun 2014. 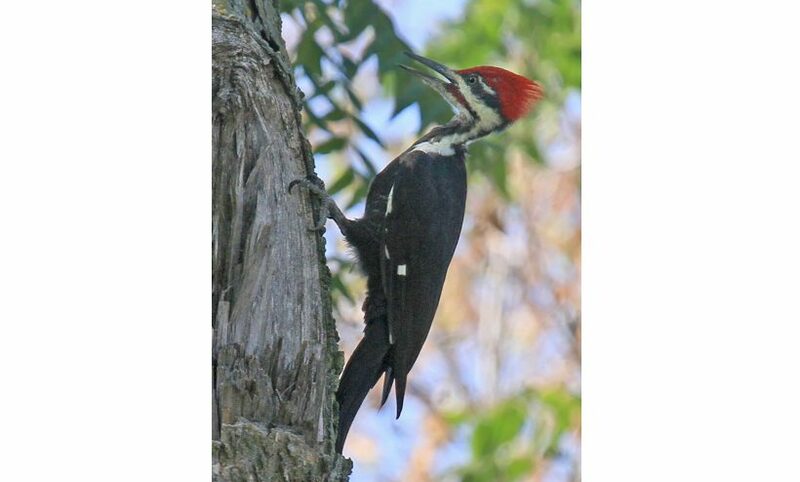 An intriguing report came from a tributary of the Big Blue River a few miles north of Beatrice, Gage Co where there is a large tract of mature riparian forest; Pileated Woodpeckers have been seen there regularly since the observer purchased the property Aug 2016 (Jen Schurman, personal communication). A suggestive report was of one seen in early 2017 on the Middle Loup River, near St. Paul, Howard Co; it is possible this bird came from the increasing population in the Little Blue drainage rather than from the Missouri River population. Expansion westward in the Platte River Valley has been slow. Early reports in the lower Platte River Valley are of one seen near Cris Lake in southeast Sarpy Co during the first week of Jun 1983 (Cortelyou 1983), one in Sarpy Co 4 Jul 1996, and one heard but not seen at George Syas WMA, Platte Co 28 Jun 2000 (T. J. Walker, pers. comm.). Bark chipping and removal typical of this species was observed in Saunders Co 14 Dec 2014, and there are recent reports in adjacent Dodge Co, where two were at Fremont Lakes SRA 30 Oct 2016 and one was found on the Ames CBC 21 Dec 2016. Reports are increasing at Schramm SP, Sarpy Co, where singles were found 23 Mar and 14 May 2016, and two were present 5 and 11 Mar 2017. One was at Two Rivers SP, Douglas Co 6 May 2016. Photograph (top) of a Pileated Woodpecker at Fontenelle Forest, Sarpy Co 1 Sep 2012 by Phil Swanson. Brown, G.W. 1975. Pileated Woodpecker. NBR 43: 20. Fiala, K.L. 1971. Pileated Woodpecker in Otoe County. NBR 39: 3. Rapp, W.F. Jr. 1953. The Pileated Woodpecker returns to Nebraska. NBR 21: 3-4. Robbins, M.B., and D.A. Easterla. 1992. Birds of Missouri, their distribution and abundance. University of Missouri Press, Columbia, Missouri, USA and London, England. Wright, R. 1991. Pileated Woodpecker responds to owl tape. NBR 59: 98-99.